Menstruation in India, is hands down, still a taboo. While that’s a shocking reason as to why someone should limit themselves to contribute to the society, reports suggests that around 23% of girls drop out from school after they start menstruating. 70% of women in India say their family can’t afford to buy them sanitary napkins, making 88% of the women resort to shocking alternatives like unhygienic cloth, ashes and husk sand. 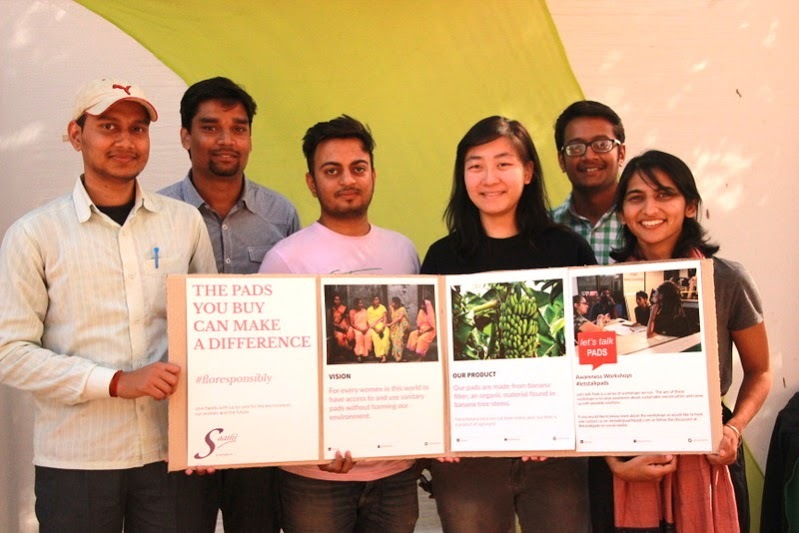 With an extraordinary vision to solve this pressing healthcare problem and at the same time save the environment, Saathi was introduced by Kristin Kagetsu, Amrita Saigal, Grace Kane and Zach Rose. We met Kristin at Maker Fest and were surprised with the depth of the otherwise usual rant about hygiene lethargy in our country. Kristin was born and brought up in New York City. A curious kid, Kristin aspired to go to NASA and build Mars rovers. Kristin met her co-founders – Amrita, Grace & Zach and was fascinated by the idea of Saathi. However, during the course of development, the concept was tweaked a bit, all for the better. With 88% of women in India who do not have access to sanitary pads, India still produces 9000 tons of sanitary waste every month. The pads in the industry use plastic and ‘super absorbents’ which end up doing more harm to the environment. Only 12% of women in India have access to sanitary pads. And that’s a small very small number. Even then every month, 9000 tonnes of sanitary waste is produced. sanitary pad available right now, across all categories use the same basic ‘Super absorbent’ materials and chemicals in these pads make them the environment’s worst nightmare. The team came up with several ideas while deciding what they wanted to make and one clicked. Saathi sources banana fibres from a banana plantation belt near Ahmedabad. Did you know the Big Tuesday (The Bada Mangal) is a Hindu festival started by Muslims?